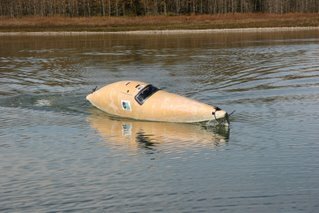 « WiTHiN ready for capsize tests! Who Hoo!!!! That was way too much fun! You HAVE to check this video out. 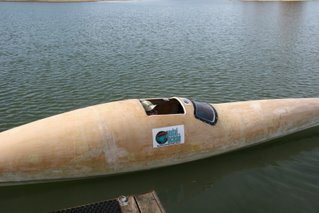 We set up a water proof lipstick camera to the bow of WiTHiN facing back, one in the cockpit of WiTHiN to catch the action from Within WiTHiN, and our HD video footage shot from the dock. Over all – a pretty successful day. WiTHiN handled at speed much like what I remembered from my kayak hull top deck weight simulation test. 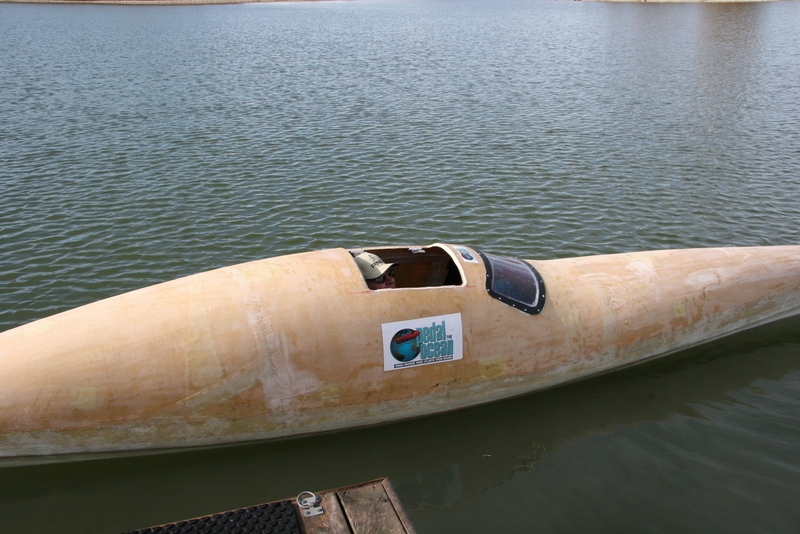 She motored right along nicely at speed and tipped quite dramatically when I threw that over sized rudder all the way to one side which was pretty fun – no concerns or surprises at all. You can see in the video how responsive she is to rudder movements. Again – she is a blast to ride! The steering has been changed from that long plastic push/pull rod to a cable loop and it is WAY easier to steer now that it used to be. We clamped 80 pounds of ballast to the floor to offset the additional weight of the full top deck and as a result, WiTHiN sits much lower in the water now. This meant that we needed to heighten the drive leg bay walls and Ben did an awesome job of converting my old flexible rubber and neoprene bladder to a nice solid wood frame which worked very well. We still have a couple of inches of water floating on top of the drive leg plug, but as long as I was not upside down, this water wasn’t an issue. 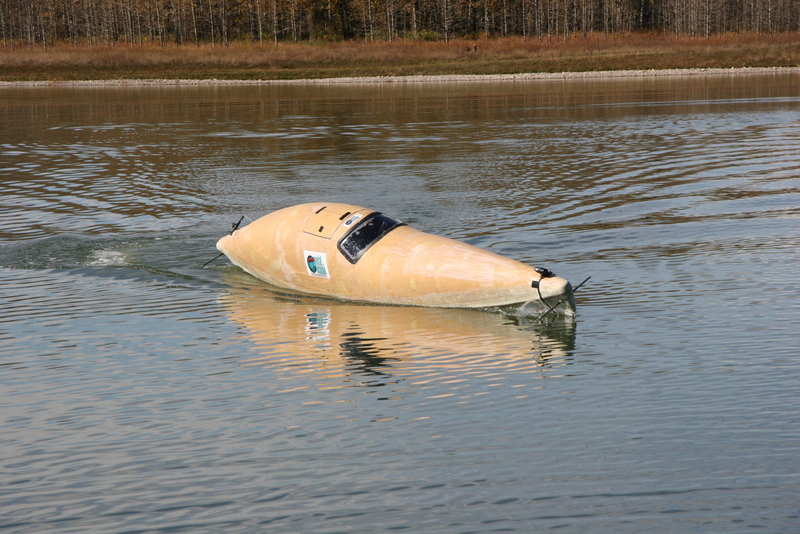 During the capsize, though, that water splashed around the cockpit, so something is going to have to be done about that. Probably a deeper plug will need to be made. 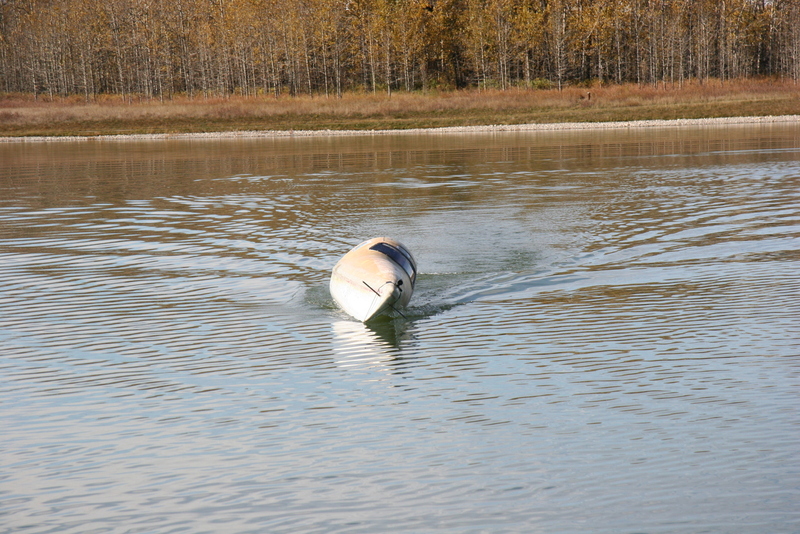 The capsize test went as per predicted. WiTHiN is not stable upside down and it took quite an effort by Ben and Cyrille to flip her upside down with me strapped into my seat. Instead of cleats on the bow and stern for tow ropes, we drilled holes through the hard points in the tips of the bow and the stern and then inserted stainless steel tubes which were bonded and glassed into place. These through holes will be far stronger than cleats when we get to sea trials and require motor boats to tow WiTHiN into and out of rough areas. 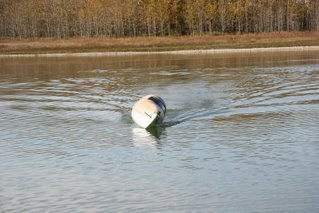 We constructed handles that fit into these through holes which were really handy for carrying WiTHiN from the trailer into the water, and for Cyrille and Ben to grab a good hold and flip WiTHiN around. We bolted a 4 point racing seat harness onto the seat rails, so even upside down, I was held firmly into my seat. After the first capsize, all of the dust that had collected inside WiTHiN instantly got dispersed into the air and I could barely see through the dust cloud inside the cockpit. I started to gag on the dust and we had to open the canopy for a while to allow it to drift out. Quite a bit of water was flying around inside WiTHiN during the capsizes which was mostly from that 2″ of water sitting on top of the drive leg plug. Some water was coming in through the hatch and we need to do a better job of sealing that hatch up. The front window did not leak at all. For safety gear, I had a diving knife fastened to the inside wall of the cockpit which if necessary, I could stab through the PETG plastic window to escape. I also have an emergency oxygen supply bottle called Spare Air. The capsizes were a blast!! Totally fun. I didn’t want the ride to stop and I am really looking forward to getting WiTHiN into some rougher ocean conditions to experience and learn about that. I am concerned about how to manage the next aspect of testing – rough ocean testing. I don’t know how to safely test WiTHiN in those kind of conditions. I imagine getting a zodiak to tow me out into rough water would be the way to go, but I just don’t know enough yet about the dangers of doing that. If WiTHiN was solid enough (no more leaks), then I could pedal her out into open ocean, but I would be concerned about strong currents either taking me out to sea, to pushing me down the coast into shore. There is a reason it took Roz Savage and Erden Eruc a month and a half to find the perfect conditions to leave the California coast for Hawaii in their row boats. Rough seas + wind + currents + shores don’t mix. The other issue that I am still looking for an answer to is stability for standing. Periodically, I will need to stand up through the top hatch, climb out onto the top deck, and climb up from the water level. Currently, WiTHiN is not stable enough to allow me to do that without tipping her over too much and risk flooding the cockpit. I need some way to temporarily add stability for these maneuvers. 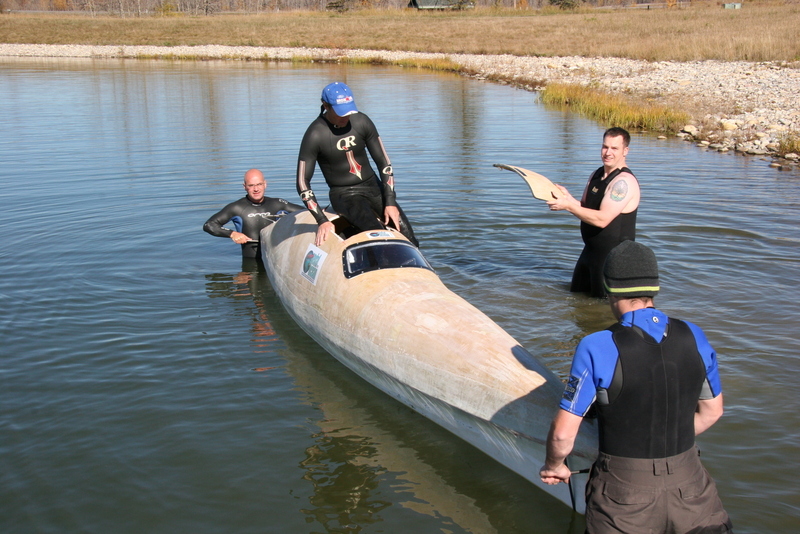 During this capsize test, we experimented with a ballast keel. I welded up a rig that strapped onto WiTHiN and suspended 50 pounds of ballast 3.5 feet below WiTHiN’s floor. This was enough extra ballast to allow me to stand up, climb-in, etc, but I don’t like it as a solution. Mostly because 90% of the time, I will be safe and snug in my seat in WiTHiN and won’t require the additional ballast from the keel – In a sense, I would be hauling around this extra weight and drag for no reason most of the time. really very much room in there! Also some of you have suggested inflatable bags, but again, there isn’t much room inside WiTHiN to store those, and I’m not crazy about all the fuss of getting them inflated and installed every time I need to stand up. Please send your ideas to the comments section of this blog post, or to me directly by replying to this email. She's looking good. Great stability even when empty. When you fill her with her stores for THE trip she should prove to be rock steady. Are you considering adding side windows? I think you might get a bit claustrophobic with just the front window. When in busy waters having the ability to glance to the sides would be invaluable in collision avoidance. Lastly, you might consider either more clearance about your head or some sort of padding around the hatch latches. I'd hate to get bloodied on those things! Here's a question for you: Have you made any contingency plans for breakage of wither the rudder, screw or both by either a big fish/mammal or contact with an uncharted reef? If so, how many spares of each and what manner of tools will you require to change out either or both mechanisms? it's all about leverage, you can have the ballast either close to the rotational axis or hang it below as a keel type structure. not as much required depending on the distance and the weight of the support. make the keel quite long, put the mass on a slide with a locking pin ( poss inside the structure) and be able to trim the boat. Prop: Install the spare from the safety boat or repair. I think that this boat is not big enough for me to carry tools, spare parts or to work on it while at sea. Therefore, to be safe, a safety boat will accompany me. Geo Tatum worked out some folding outriggers for his wavebike many years ago. Something like that which hugs your hull a little better might be devised to provide stability for standing. It might disturb the clean lines of your outer design, though. The outriggers maybe could be shaped so a concave side could lie flat against your hull when not deployed. Sorry if I missed this on your site but how much food and water will you carry? Or will the support boat supply? I like the idea, but I do want to avoid having anything hanging out on WiTHiN. I really want to keep the outside shell as smooth as possible. Less for wind and waves to catch onto. re: food and water – The plan in my mind at this point is to try to take as much food as I can along with a small water maker. I would like to consider the 'support boat' a 'SAFETY boat' and if I do not require contact with it, then I could claim that my crossing was solo and unsupported. I know you've probably got Within's canopy all sorted and probably worked out for the best aerodynamics, but I'm wondering why the stern slopes down so much. If you could face a redesign, what about having the canopy with a Kamm tail, and a stern hatch, that way entering from in the water for instance would mean you're going in low (no climbing up and out) and you're also going in along the centre line. Mind you, it'd mean anything stored in the aft "cabin" would have to be stowed in watertight containers/bags, but it would mean no stability worries. Second idea, what about a drop keel? obviously you've not got room for a dagger board arrangement, and a centre board with a bulb on it and a single pivot is never going to work because the bulb will be at vertical when retracted, so how about a parallelogram hinge arrangement which would keep a long thin torpedo shaped bulb weight horizontal the whole time. You could even have it retract up out of the way and lock in securely. You would of course only be thinking about deploying it when it was calm enough to open the hatch, so there wouldn't be so much risk of breakage. Hi, Greg, and Good Luck!! Have you thought of gyro-stabilization re: standing up? Also, you could save weight if you added ballast as needed using a pumpable water bladder. 1. Pad around or smooth off all sharp objects, esp. near your head :-). 2 No keel nor ballast: too much drag, and/or danger of stress cracks if built too highly specced. Neither fixed nor moveable give adequate performance and safety. I can't think of anything better than swing-out floats for when standing. Streamline them and attach them sufficiently above the waterline to eliminate drag, and angled about 15degrees down when deployed so the floats contact into the water. You had mentioned a request for ideas re. being able to stand up with stability. Your boat is very streamlined and low profile. 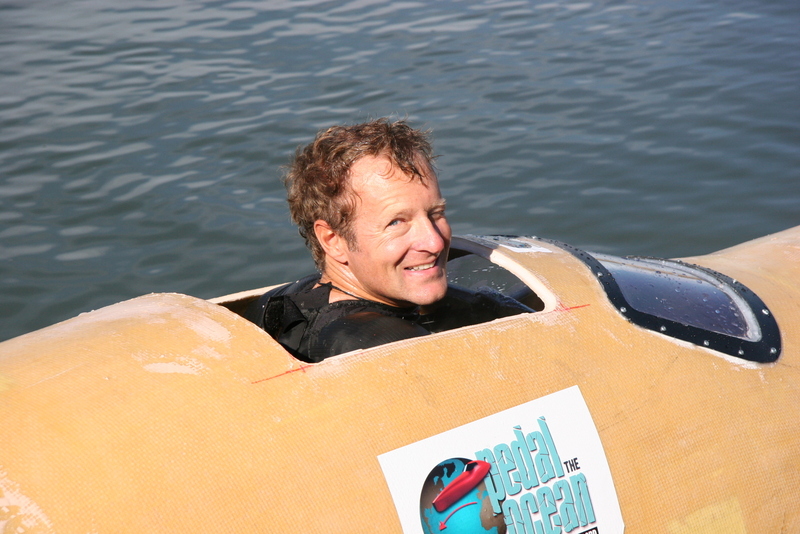 At the speed at which you will be pedaling, would an aerodynamic trade off for a bubble canopy top be worth the ability to stand and not have to open anything in the open ocean? Also, this would address the visibility issue noted by one other person (above). Another thing that us sea kayakers do is using a couple of rope loops (u clamps) on either side of the deck that a paddle with a float can be attached to temporarily. 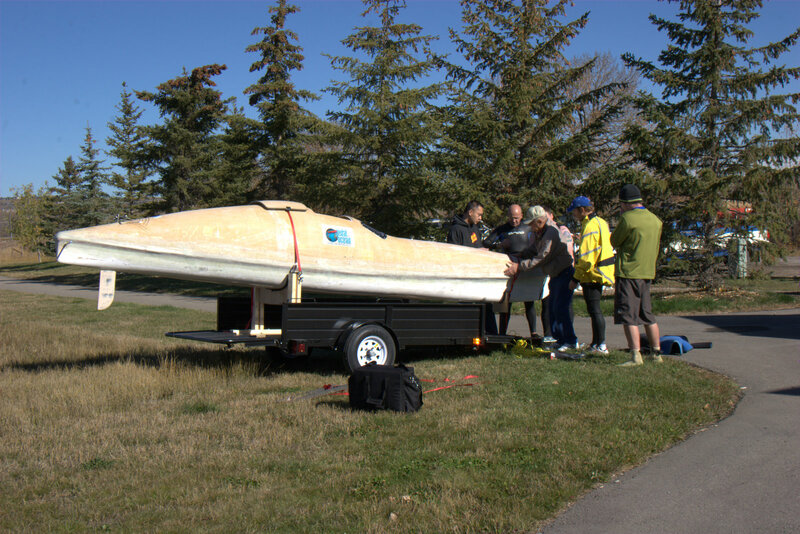 this does not stress the boat or "outrigger" as much as you might think when the float is small and provides an amazing amount of stability when you keep your weight on the same side as the support. If you also keep the attachment rope and small diameter, the worst that can happen is the rope might break. It might be sacreligious to suggest this but your boat would go like stink with a tiny sea kayak sailing kite. These Kites also give a lot of lift and stability and might be a smart emergency safety measure in case you have a catastrophic drive failure. my kite would easily pack into a bicycle water bottle.